PORT-AU-PRINCE, Jan 6 2011 (IPS) - Dieula Rosemond is tired. A lone swaying palm tree yields a little shade over her plastic chair. Her hands are folded in the lap of her white dress. Little girls play with a ragged, pale-faced doll behind her. Another day in Camp Imakile Deplase. Almost a year after the Jan. 12, 2010 earthquake, Dieula is one of over a million people living in scattered makeshift camps ‘anba pwela’ – under tarps, or tents – in Haiti’s bustling capital city. She and her husband Joseph lost their livelihoods with the collapse of their tiny house in Cite Soleil, which doubled as an electronics repair shop and store. Until last July, they and at least 50 other families lived in Plas Imakile, a public square. They endured nighttime attacks for weeks by a gang trying to force them off the property. Joseph went to a nearby joint U.N. peacekeeper and Haitian police base to ask for help. But the few jeep patrols that came by never stopped. The gang simply waited until they were gone to enter the camp and terrorise the people, slashing tarps with machetes. At the U.N. base, Brazilian Lieutenant Edison Campista told IPS he was aware of the reality but could effectively do nothing about it except to increase the frequency of patrols. He admitted the gang could elude authorities if they communicated by cell phone. Haitian police officers dismissed Joseph, claiming he was exaggerating the threats the camp faced. The attacks continued. One man’s phone was stolen and he was struck in the head. The International Organisation for Migration, a U.N.-affiliated relief agency, told them to wait until a new piece of land could be found. Finally, Dieula and the others left, moving a half-mile down the road to a clearing next to a foul-smelling canal. Goats bleat as they clamber over small mounds of trash. The camp is called Imakile Deplase to remind visitors of how the people there were displaced against their will. Deaths from a raging cholera epidemic have surged in recent days to nearly 3,500. In early November, a young man in Dieula’s camp contracted the virulent disease and was rushed to a Doctors Without Borders hospital. By the time he came back, his wife and children were infected. His family was the first of several to fall ill.
Doctors Without Borders says it has treated about 63 percent of all cholera patients since the outbreak began in October. The head of the organisation recently slammed the U.N. and other aid groups for the rash of preventable deaths, calling their response “the latest failure of the humanitarian relief system”. “The NGOs and the government are continuing to give minimal levels of aid. But that’s not what we need. 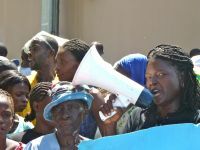 We need houses, as it says in the Haitian Constitution,” said Sanon Renel, an activist with a newly-formed committee to stop forced expulsions. “The prime minister is not here,” staff politely told Joseph, when he and other camp leaders delivered a letter outlining their needs to the office of Jean-Max Bellerive. Joseph received assurances the prime minister would read it and furnish a response, but none ever came. An expo to showcase designs of houses to be built for earthquake victims was scheduled for October 2010. It was delayed to this month, and then again to March. The November election launched the country into yet another crisis, with leading candidates calling for the vote to be annulled or disputing preliminary results. Thousands were unable to vote. “I voted for [René] Préval in 2006. I thought he would change things. I thought his mind was with the mass pep [the masses]. I thought he would return Aristide,” Dieula said. “It’s the blan who are holding him in place. He works for them!” she said, using the Kreyol word for foreigners. Jean-Bertrand Aristide, the former president, was whisked out of the country in February 2004 on a U.S. jet in what his supporters say was a modern-day coup d’etat. The United States says he asked to be taken into exile. In an explosive interview last week, a Brazilian diplomat representing the Organisation of American States in Haiti said the “core group” of the international community met on Nov. 28, 2010, the day of the chaotic election. They discussed removing Préval from the country by plane. “I heard that and I was horrified,” Ricardo Seitenfus told Folha, a Brazilian newspaper. Prime Minister Bellerive arrived at the meeting, which included the OAS, U.N. and donor countries. “He asked if President Préval’s mandate was being negotiated. And there was silence in the room,” Seitenfus said, adding that OAS Assistant Secretary-General Albert Ramdin did not say anything. Haiti’s electoral council announced Tuesday that the second runoff round cannot take place until late February. According to the Constitution, Préval’s mandate should end on Feb. 7 to make way for his successor. OAS observers arrived in-country after the holidays to recount ballots, a process endorsed by the Haitian government and international community. The OAS observer mission said there were only isolated “irregularities” on election day. However, a new study of more than 11,000 voter tally sheets by the Center for Economic and Policy Research, a Washington D.C.-based think tank, found fraud and inconsistencies rising far beyond levels acknowledged by the OAS. “If the Organisation of American States certifies this election, this would be a political decision, having nothing to do with election monitoring,” said the group’s co- director Mark Weisbrot in a statement. An OAS spokesperson did not return calls or email messages seeking comment. The Brazilian newspaper Estadão reported Monday that Seitenfus says he was dismissed by the OAS on Christmas Day, shortly after he first spoke out in an interview with the Swiss newspaper Le Temps. “There was an immense repercussion and it surpassed everything I was thinking or imagining,” Seitenfus said. He condemned the international community’s engagement in Haiti, saying the country had suffered for its proximity to the United States. *Ansel Herz blogs at http://mediahacker.org. This is the first of a two-part series on the political and human rights struggles of Haitians one year after the country’s devastating earthquake.